Lock in a great price for Falkensteiner Hotel & Spa Iadera – rated 9.2 by recent guests! The hotel is very beautiful; the design is modern and clean. It actually looks like a ship, with cabins. The decoration is ‘clean’ and relaxing. The surroundings (the garden, beach) is superb and you can have a pleasant walk ob the shores. The staff is very friendly, professional and forthcoming. The food (breakfast and dinner) were very tasteful and there was a variety to choose from. The highlight of the hotel is the spa area. The pools aren’t the biggest, but the infinity pools combined with the marvelous views of the sea and mountains are incredible. The best prt of the spa is the black box. This is without a doubt one of the best spa experiences in Dalmatia. I am returning guest so... 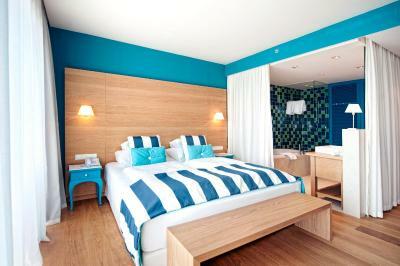 I just love Flakensteiner hotels... where ever there is a Flakensteiner, it`s my #1 choice. And this hotel is absolute #1 choice. The location was superb, with the alley by the sea. Beautiful landacape. I also enjoyed the grill menu from the hotel restaurant. Sea food was great. Really nice and big room, comfortable bed, great breakfast, great view to the ocean. You can go on really nice walks by the Ocean. Very cool design, both the rooms and the common areas. Semi private beach, sunbeds complementary, very secluded from the rest of the town. Super professional staff, very clean. Excellent breakfast, really high level. Superb spa, as long as you don't mind being naked there! Our favorite hotel in North Croatia with Falkensteiner quality!!! Perfect destination to relax and pamper up. We enjoyed the sea, the beach, the spa areas, the green lawn, the remoteness and the quiet atmosphere. Friendly staff and a comfortable room. The staff parked our car and brought it to us whenever we needed it. The musical program in the evening was also very nice and nonintrusive. Fresh fish at the fish restaurant. Falkensteiner Hotel & Spa Iadera This rating is a reflection of how the property compares to the industry standard when it comes to price, facilities and services available. It's based on a self-evaluation by the property. Use this rating to help choose your stay! 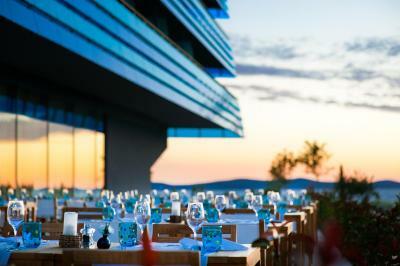 One of our top picks in Petrcane.The Falkensteiner Hotel & Spa Iadera is located on the private Peninsula Punta Skala, 7.5 mi drive from Zadar, offering amazing vacations in a relaxing, intimate and stylish atmosphere on the peak of the Punta Skala Peninsula. 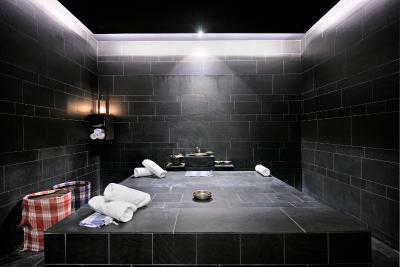 The vast wellness, beauty and fitness area which is over 20 ft² and the Acquapura Spa provide a superb possibility for relaxation. The rooms feature comfortable seating areas and many other state-of-the-art amenities. Taste from a variety of international, Mediterranean and regional cuisine, buffets and front-cooking stations. Have a chat in the Sotto Voce lounge bar with a fireside lounge, a cigar lounge and a terrace. All the bars and restaurants of the Falkensteiner Hotel & Spa Iadera offer a wide range of culinary delights. Zadar Airport is 14 mi from the property. This is our guests' favorite part of Petrcane, according to independent reviews. When would you like to stay at Falkensteiner Hotel & Spa Iadera? 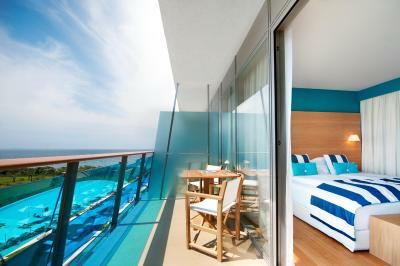 This air-conditioned double room offers a view of the sea and a balcony. Featuring navy-style furnishings and linens, the room has a flat-screen TV. The private bathroom is fitted with a bathtub. Please note that the maximum occupancy is 2 adults and that extra beds are not available in this room type. Child policies do not apply to single use rates. Private parking is available on site (reservation is not needed) and costs EUR 9.50 per day. This bright, air-conditioned room features navy-style furnishings and a flat-screen TV. The private bathroom includes a bathtub. Child policies do not apply to single use rates. Please note that the maximum occupancy is 2 adults and that extra beds are not available in this room type. Spacious junior suite with a seating area. This bright, air-conditioned suite with white furnishings and wooden elements also features a dining area and a coffee machine. A sitting area with a sofa and flat-screen satellite TV is available, as well as a safe and a minibar. The private bathroom includes a bathtub. Please note that the room rate is based on 2 adults. Maximum occupancy is 2 adults and 2 children (see extra beds rates). This air-conditioned suite with colorful navy-style striped elements features views of the sea and a seating area with a sofa and flat-screen TV. A safe and a mini-bar are at the guests' disposal. The private bathroom is fitted with a bathtub. House Rules Falkensteiner Hotel & Spa Iadera takes special requests – add in the next step! Falkensteiner Hotel &amp; Spa Iadera accepts these cards and reserves the right to temporarily hold an amount prior to arrival. Falkensteiner Hotel & Spa Iadera accepts these cards and reserves the right to temporarily hold an amount prior to arrival. Please note that parking is mandatory for guests arriving by car. Please note that special conditions may apply when booking more than 5 rooms. One of the best hotels I've ever been to. Amazing staff,service. Will definitely return again. The shower had really bad smell from the drain. The best wellness we have ever been in. The stuff is really nice, my boyfriend eats gluten free and lactose free and they provided us everything we needed. Everything was great. Great professionalism. Furniture in the rooms and some of the common areas would need to be refreshed. It is one of the best hotels we keep on visiting, for years now. We've been here before, we'll come again. A beautiful 5* hotel with a great spa area and a very large and delicious breakfast buffet. What isn’t there to like? Unfortunately the hotel room. 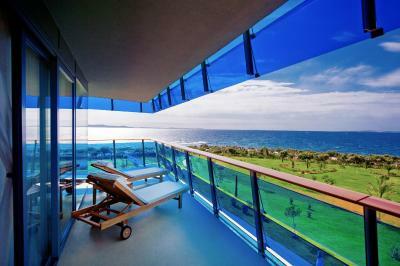 Although spaceous and modern with stunning views on the sea and mountains, the design isn’t convenient. Designed as a ship cabin, you have the bed in the middle of the room, next to it is the open shower, bathtub and sinkand. A little toilet without a proper soundproofing 😉There is very little privacy even for long time couples. You inconveniently wake your roommate in the middle of the night just by washing your hands. I do understand that that is because of the room type and size; but, for the premium price... I suggest you book a bigger room if the mentioned things could bother you. The pools weren't well kept and should be cleaned more often. The rest of the spa is in better condition, but the overall impression is decreased. Hotel was very nice and the staff was polite and professional. The spa is amazing and it offers variety of different treatments and services, so you have a lot to choose from. This hotel is a great choice if you're interested in relaxing holiday. Outstanding in every possible way. Get the room with the sea view worth every penny. There's nothing wrong per say but a few things should be noted: Beaches in Croatia are never private, so the hotel is surrounded by a public, rocky, stretch of beach. The water is clear and teaming with marine life. There are even a few sun chairs supplied by the hotel but they're not as nice as by the pool. Parking is easy (valet) but comes at a mandatory price. No public parking nearby. It's also tricky to reach outside restaurants by foot - if not impossible. But such is the price of having a far-away peninsula (almost) to yourself. Falkensteiner Iadera is a wonderfully secluded luxury refuge that never feels crowded despite it's considerable size. The hotel and its grounds encompass almost the entire peninsula with well kept gardens, three pools and plenty of sun chairs on the terrace or in the shade of many olive trees in the park. The spa is a beautiful gem with absolute privacy and well organised, delightful treatments. The staff here, as well as in any other part of the hotel is kind and helpful, always service with a smile. Rooms come in different categories, most distinctively in sea and park view varieties. But it should be noted that due to the layout of the complex and the peninsula, almost every room has at least partial seaview either way. Regardless of that, all of them are spacious and have a nice maritime color theme. Plenty of vanity products as well as bathrobes, slippers and a bag for taking all your stuff to the pool or beach. Food is also excellent. Should you chose to take the half-board you're delighted with a plethora of varying buffet items and show cooking stations every night. The breakfast buffet also leaves nothing to be desired. You can sit outside or inside just as you choose. The room cleaning was basic. The food in the main restaurant was hit and miss. Lack of hotel shuttle bus to nearest attractions. Pool facilities were excellent. The restaurants were varied and provided different choices.